We all have an Inner Fire that is waiting to be unleashed! Fire Up, viral your work and make your contributions BURN. Transformation coach Cherry Africa helps people to be the best version of themselves. Cherry has committed herself to training thousands of Filipinos in the next years through a reverse engineering mind coaching tool called Neuro Linguistic Programming. Cherry is one of the most followed Transformation coaches in Asia. This is the fuel that burns Cherry’s mission in creating corporate consciousness built around total human awesomeness. Cherry has inspired more than 300,000 individuals with her never ending energy and fire, working with her team at World Stage International to build a global business built on genuine and inspired change work. Cherry started her career in brand marketing at Procter and Gamble which saw a growing talent in her in the field of leadership and strategic thinking, having graduated in college with a diverse and wide experience in youth leadership. Cherry owes her great formation at P&G, where she was exposed to global thinking and a Never-Say-Die champion mindset which honed her further as a leader, communicator, thinker and influencer. It was also at P&G where Cherry met her husband Edwin with whom she works with never ending passion to raise two beautiful daughters, Gabby and Dani. Even after she has left P&G to conquer new passions, the Transformation Rockstar continues to be ‘proctoid’ in her discipline when it comes to analyzing facts, leadership flexibility and a great sense of accountability the behaviours of which she continues to manifest in her actions everyday. In the course of her multinational career in brand building, Cherry realized that her passion was in building brands around people. “I want to participate in everyone’s human becoming. I got very interested in the narrative of human breakthrough and transformation.” Cherry then moved on investing her time, sweat and energy into learning more about how people ultimately become their highest version or how they sabotage their own destiny of awesomeness by deciding to be just average. Cherry dug deep into human mindsets and how this impacts one’s beliefs, meta programs, values and decisions. She studied the codes that lead to success, duplicated these in her businesses and personal life and later on designed frameworks on human transformation that are now the building blocks of her change work with individuals and teams. Her Circle of Fire™ jumpstarted her transformation work in Singapore, Malaysia, Thailand, Vietnam and in her home country in the Philippines where she continues to work with companies, teams and individuals in both the private and public sectors and the youth. Living in Singapore, Thailand and Malaysia for 14 solid years, she learned more about how the brain works and how people are capable of accelerating their breakthrough success in an instant. She trained to be a Master Practitioner of Neuro Linguistic Programming, Hypnotherapy and Time Line Therapy licensed by the American Board of NLP™ and a became a Certified Masterclass Trainer in Singapore. Up until now, Cherry continues to master the codes of NLP, making sure that she practices what she teaches and has launched a movement called LiveNLP, where the core principles are practiced, shared and mastered in the board rooms, office cubicles and in their own homes. 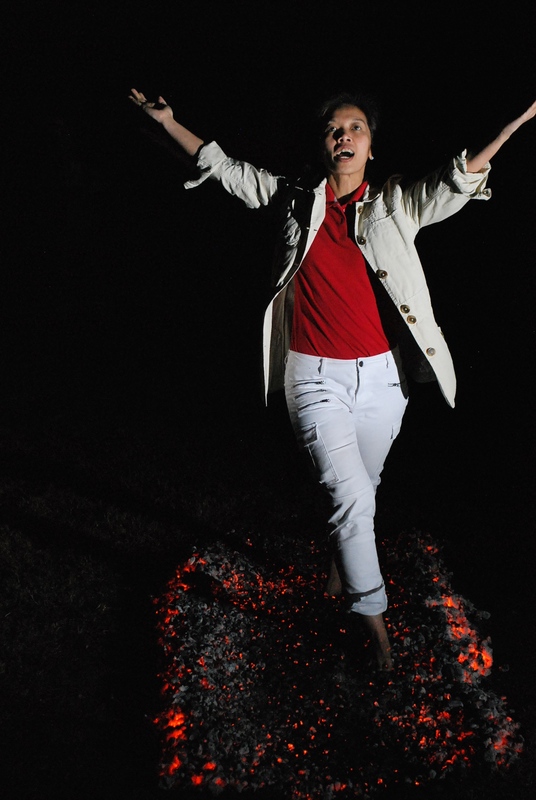 It was when Cherry attended one of the world’s top motivational speakers Anthony Robbins ‘Unleash the Power Within’ seminar in Singapore did she have her first taste in walking on a bed of hot burning coals also known as Fire Walking. After 5 years of working with people and building her own experience base, Cherry refuelled her courage tank to bring her biggest dream of working with the Anthony Robbins Foundation into full locomotion. She assisted Tony’s team as a youth coach in his UPW seminar in Dallas in 2013 and on the same year became certified as a Firewalking Instructor by the Firewalking Institute of Research and Education in the USA. To enable teams and people with a roadmap in shaping this fire, Cherry worked with Sally Hogshead, leading author and founder of the Fascinate Advantage System™ to build people brands within teams and businesses and in the process, allow their highest versions to create better relationships, reach higher sales, grow your business and become intensely valuable to those who matter to you most.